In my latest real estate article for sellers – What Condo Docs Do I Need When Selling My Condo? – I list off the condo docs a seller needs to provide to a buyer as per the residential resale condominium purchase contract. When you’re a seller, you may already know what is discussed in your condo docs – you may even have been on the condo board. 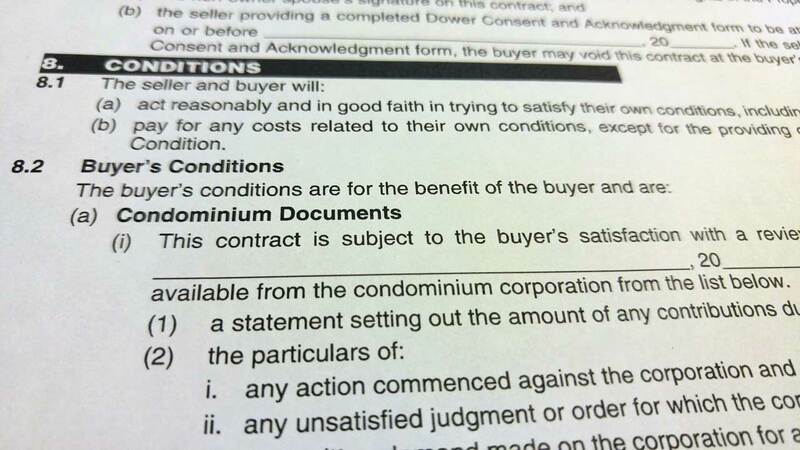 But what do you need to know about condominium documents as a buyer in Alberta? You’ll receive these documents if you have a condo document condition in your purchase contract – and you would be wise to go through them carefully. It might also be beneficial to hire a condo document review company to help you and explain what everything means. Here is a list of what should be provided and some tips on what to look for. This document sets out the rules of the condo. This tells you what an owner can do, what they are responsible for paying for and how the condo will run. These are very important. Some things you’ll want to specifically look for are policies about age restrictions, pets, fines and what is the responsibility of the owner to pay for and what will be covered by the corporation. A lot of the bylaws are dictated by the Condominium Property Act and Regulations. But each condo building is different. Financial statements let you know how well a condominium building or complex is managing its money. You will see a balance sheet laying out what assets and liabilities the corporation has as well as an income statement that shows you the money coming in and being spent. Pay close attention to how much money is being saved for the future and what is being spent on each item. Along with the budget, these documents tell you a lot about how well managed a condo is. Anything in here is a reflection of the physical state of the building. Pay close attention. This is like any household budget, but more complicated because it deals with an entire building. It will tell you how much money should come in through condo fees, parking charges and laundry revenue and let you know what the board plans on doing with the money. You could see expenditures on utilities, repairs, maintenance, cleaning, management fees and reserve fund contributions. What you won’t see here is any profit. Condominium corporations are true non-profit organizations. Anything not being spent on the condo in this year’s budget will be saved to be spent on the condo another year. There are a few types of meetings minutes – most of the time we are concerned with annual general meetings and regular board meeting minutes. The annual general meeting doesn’t always say much about how well the condo is doing, but there can be some important indications as to what is going on. The board meeting minutes will let you know the day to day status of complaints, issues, financial situation and repairs that the board is discussing. If you want to know what is going on with a condominium, this is one of the best resources and the most current information you’ll find. Read these very carefully and ask questions about anything that seems like it might concern you in the future. Meeting minutes let you know how well the board is dealing with items that come up running the building or complex. Make sure this document is current and that the policy is adequate. It is illegal to not have insurance on a condominium building. This is an extremely important item. This item is not that common, but nonetheless it is important. This will let you know if any of the common property is being leased out or if there are any agreements that someone has the exclusive use of a part of the common property. This information is not always provided accurately, so ask questions if something seems out of sorts. You need to know if someone is leasing something that you own, and when you own a condo, you typically own more than just your unit, you own a portion of the common property. Sometimes that’s storage, or parking or a hallway or a party room or a swimming pool. Some condominiums have recreational areas and these areas may allow people who don’t live in the building to still use the recreational area – perhaps a workout room or a pool or something like that. You’ll want to know what the rules are around these areas. Are the exclusively for the use of the condo owners, or owners and guests, or can they be rented by just one owner for a party or event? Find out if this applies to your potential purchase and whether it will affect you. A property manager will affect your life as an owner. Some managers may charge more than others and some management agreements may have strange permissions and charges in their contract. I have seen some very strange terms in management contracts that have raised red flags for a condo purchase. According to Section 30 of the Condominium Property Regulation, a reserve fund study must be done every 5 years. Make sure you have one that is done within this time frame to be sure it is an accurate study. This study looks at the building as a whole and figures out what is in need of repair and when it will need work. Look for a study that looks substantial and covers all the areas of the condominium building or complex. Things like the roof, windows, parking, lights, exterior, flooring, doors, structure, sidewalks, and mechanical systems must all be looked at and factored in to the scope of the study. A reserve fund study is super important in telling you how the condominium is doing physically. It should tell you if something big is going to need replacement and what it will cost. A reserve fund plan lets you know what the condo board is planning on doing with the information in the study. Will they save up to replace a roof in five years? Will they decide to paint the hallways next year? A well run condo will have a detailed plan on what needs to be done, when it will be done and how much it will cost. This is usually listed on something called the information statement. It lets you how much money is saved up for large capital expenditures at the condo. If this amount doesn’t look like it will cover the current items needing repair or replacement in that reserve fund study, a special assessment may be on the horizon. Some concrete buildings have cables holding the structure together. Since this is such an important part of the building and maintenance of this system is so important, the government makes it an item that needs to be provided to owners at their request. There have been buildings in the past that suffered cable deterioration because of poor maintenance. If there is something wrong with these cables, it may be a very expensive problem. If a condo is falling apart, you’ll want to know. This statement will let you know if any structural work or issues are currently an issue with the building. Sometimes there are none and the information statement will just say “no structural deficiencies are know to the corporation”. A condominium plan looks like a top-down view of the building which shows you the floor plan of the units. Also included is often a side-view that shows you each unit and each of the floors. The plan also tells you the size of each unit (based on the builder’s drawings). One of the most important parts of the plan is the unit factors assigned to each unit and how those are calculated. The plan will also tell you when the building was condominiumized. Additional plan certificate sheets are often overlooked. It is a document registered with the Alberta government that lets you know who the current manager is of the building and when the bylaws were last registered at land titles. It will also let you know if the board members are registered at land titles as well. This information is usually listed on an information statement that the manager will draw up. This lets you know the official condo fee charged for the unit you are looking to buy. It should also show you how that amount was decided and how it is to be paid (monthly is most common). The amount owing for the unit is really important. If the seller hasn’t paid their condo fees or a special assessment, this amount will have to be taken off the selling price of the condo. If this is a high number, the seller has no been paying up. This could be a problem for a buyer if the selling price isn’t high enough to pay off this charge. Think if the condo sells for $200,000. If the mortgage is $180,000 and there is an amount owing of $30,000, this seller is going to be $10,000 short. They really can’t sell the unit until they pay that $10,000 off. This is basically a question as to whether the condominium corporation is being sued. If they are, you’re going to want to know why. If there is an action, it should appear on the information statement. This will let you know if the corporation still needs to pay someone – either for work done or wrongdoing. So if there was an action commenced, but it hasn’t been paid out yet, this will let you know. Again, this appears on the information statement that the condo manger writes up. Is someone demanding money from the condominium corporation? Did a contractor do work for which she was not paid? Did someone slip and fall on the sidewalk and wants some compensation for lost work time. If this is the case, the information statement should state this. This item is not for day to day items, which is why the threshold is $5000. Get more details if this issue comes up. There you have it. Each condo document is important for different reasons and you should be looking at them carefully when you make on offer on a unit. Ask you real estate agent for help in understanding what these items mean and don’t forget it may be a good idea to ask for professional help from a condominium document review company when checking over these documents. If you have any questions about condo docs, please give me a call.